Happy Thursday! I am so glad the sun is shining again today as it means some of today's advice is easy to implement :) Before I start please do read to the end as there's a local event that many of you will be interested in at the end of the blog. Get yourself a lovely cuppa.. herbal tea or water of course and lets begin... It's long! Much longer than I expected! So the sun not only makes us nice and warm and brown (unless you are me and always a whiter shade of pale) it also provides us with an extremely important vitamin - Vitamin D, which may I add a lot of people - it's estimated 1 billion people worldwide - are deficient in. Wrinkles - Vitamin D has the ability to act as an antioxidant. This helps your body to fight off free-radicals which are thought to cause lines on our skin and the general deterioration that comes as we age. Boosts Calcium - Vitamin D controls calcium and phosphate levels in the blood, supports both bone growth and strength. It increases the absorption of calcium in the small intestine and as a result, may help us to reduce the risk of osteoporosis. Strengthens the Immune System - in our body we have "T-cells" which work to protect us against nasty bacteria and disease. Vitamin D is crucial in the formation and function of these cells and it can even stimulate your immune system to produce cathelicidins that kill off nasty viruses. Fights Disease - studies have shown that many diseases including Multiple Sclerosis, heart disease and cancer can be improved with higher vitamin D levels. Recent studies have shown that up to 75% of cancers can be prevented by getting enough Vitamin D.
Eases Inflammation - several studies have demonstrated the power of vitamin D to reduce inflammation and pain, operating at the DNA level to regulate genes to reduce inflammation. This goes for all inflammatory conditions from muscular recovery and pain post exercise to osteoarthritis and inflammatory bowel disease and everything in between. Helps Depression - we've all heard of SAD (seasonal affective disorder) this can be triggered by a Vitamin D deficiency. It's thought that having access to little sunlight can alter our body clock which, in turn, leads to feelings of depression. It can also interfere with our levels of Serotonin, a chemical in the brain that can cause mood changes. And that's just a few things! Pretty important vitamin wouldn't you say? How do I know if I need more of it I hear you say... Well for one we live in the north of the UK, we don't get much sun at all! Two with the amount of people deficient worldwide, if you don't feel 100% happy, healthy and pain free there's a good chance you're deficient too, so my advice is - with all those benefits we all need more of it!! Ok, now you know you need it here is how you can get more of it..
Get out in the sun more!! The body makes around 90% of the Vitamin D it needs but this only happens if your skin gets enough direct UV light from sunshine. It's not possible to make too much vitamin D from the sun, as the body self-limits the amount it produces, but it's very important to avoid burning. The recommendations as to how much sun you should get per day vary from 10 - 30 minutes, but for the majority of the population the government recommends 10 minutes outside in the sun, between 11am and 3pm, with arms and legs exposed. In the U.K. it's only possible for our bodies to make vitamin D in the summer, October through to March the angle of the sun is too low for enough UVB to reach the earth's surface and we have to rely on the reserves of vitamin D that our body has stored up during the summer months or from other sources. The other 10% of your Vitamin D intake should come from foods rich in the vitamin - oily fish is one of them. The fish with the highest vitamin D content is raw herring, followed by canned sardines in brine and oil, and then wild salmon. Baking or steaming (without oil) results in the fish retaining more Vitamin D.
Vitamin D supplements are advised by many health practitioners and the new advice from Public Health England is that adults and children over the age of one should consider taking a daily supplement containing 10mcg of vitamin D, particularly during autumn and winter. Should you consider taking one? Well if you're not getting enough exposure to the sun and most you're gazing out the window looking at the lovely English weather longing to be sat on a roof top terrace overlooking the sea in the sizzling sun (that's me) then you know all too well that sunshine isn't always a reliable option for us, additionally if you live a fish free life then chances are you're not getting enough Vitamin D, especially in the winter. Not all supplements are created equal so if you are thinking of taking one please be sure to do your research, or send me a message and I will give you some help! Join me Claire McCarthy and Cath Hopkinson with the fabulous Cherry Baker Education. She is going to be sharing her expertise and knowledge about pelvic floor. It will be presented in a hilarious and informative format. Grab a friend or a few for this educational, evening, giggles are guaranteed! Evening starts with Prosecco at 7, then sit down for a 7.30 start. 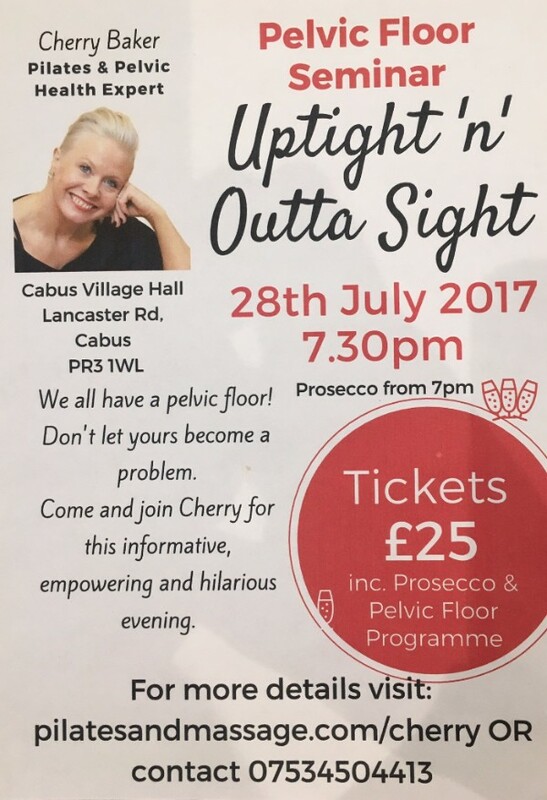 Tickets are £25 and include a glass of prosecco, your fun informitive evening and a pelvic floor programme. You will receive a programme to put into practice. 1- if you are a member of Pilates and massage, please inform me of how many tickets you would like and I shall take payment via your Gocardless account.